Many skiers who have purchased our competitors shock absorbing roller ski tips (ferrules) found them to be so unreliable that they told us they would never buy them again. We discovered that the unreliability was due to poor design. 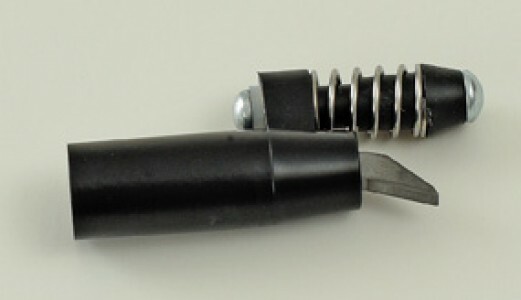 In order for a rollerski ferrule to be strong and reliable the carbide tip must be firmly embedded in the plastic housing. Why? Because carbide is extremely hard, stiff, and by nature, very brittle. We tried many different carbide formulations before we found the best compromise between hardness and strength. Next, we had to figure out how to encapsulate the tip in the plastic housing so it would not bend and break. Many manufacturers glue the carbide tip to the plastic, but our experience with bonding was that the carbide-bonding agent was never sufficiently strong and stiff enough to prevent movement of the tip which causes it to snap. We developed geometry between the carbide tip and plastic which has been a bullet proof design for the last fifteen years. When we decided to design shock absorbing ferrules we knew from experience that trying to spring load the carbide tip was not the answer. Springs can fatigue, so if carbide is dependent on the spring and the spring fails, the carbide fails as well. We speak to a lot of customers who tell us about problems they experienced with competitors spring-loaded ferrules. A very large number of skiers broke the competitors spring-loaded tips on their first outing. One V2 customer in particular relayed that he had a miserable day trying to ski eight miles back to his car on very hilly terrain with no poles after a competitor’s tips snapped. He swore that he would never use spring-loaded ferrules again. It was only after he realized the logic of our vibration absorbing design that he decided to use the V2 Spring Ferrules. The main advantage of the V2 system is that if the spring mechanism should fail, the reliable carbide tip will remain functional.